Many times PC forget that they have earned Action Points. Having a physical representation of the points that you as the Dungeon Master can hand out when they earn them, and then collect when they use them is very useful to make sure that they are used properly. 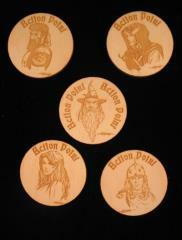 These Action Points are 1.5" inches in diameter and have an iconic DID image drawn by Larry Elmore. Compliant with the Dungeons and Dragons 4th Edition GSL. Please note that the picture shown is just a representation of the product. You will receive the type listed in the title.